A number of my friends have alerted me that the Tour de France has started up again, assuming that due to my interest in cycling and impending cycling trip to Europe I would naturally want to be involved. I appreciate that it's really hard to cycle that hard and that fast for that long. I appreciate the thrill of the chase, the need for speed, the visual excitement of massive accidents. But, largely because of Lance Armstrong, I just don't care. Why hate on Lance? Partly it's because I thought his book was terrible (and a really bad intra-office holiday gift, by the way), which portrayed him as a thoughtless, arrogant jerk on all levels. Partly it's because he probably cheated (though likely steroid use hasn't deterred me from buying limited edition Barry Bonds jerseys). The Livestrong yellow bracelet fad rang false to me, creating this sense that people who'd merely spent a buck on a piece of rubber were suddenly tough and altruistic, and had license to advertise it to the world. All together, not enough to disrupt my gentle television habits of Giants baseball and Seinfeld reruns. 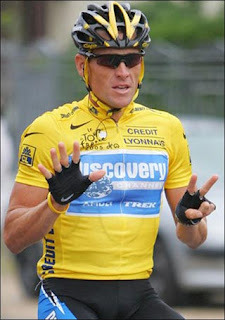 another reason why I'm not into Lance, and not into the Tour. Oh, and by the way you're punishing an entire sport based on one person (and by extension anyone who is doping and gets away with it). There are some people on the tour who do not dope. How do you justify being a fan of cycling and the bicycle and hating on the tour? By similar logic you should have given up following baseball by now and I know that's the case. I'll take my response off the air, thank you.